NEW YORK — Elvis Costello, B.B. King and Ray Davies are among the nominees for the 2013 Songwriters Hall of Fame. Also nominated are Fleetwood Mac’s Stevie Nicks, Lindsey Buckingham and Christine McVie, former Eurythmics bandmates Annie Lennox and Dave Stewart, Jeff Lynne, Steve Winwood, Aeromsith’s Steven Tyler and Joe Perry, Bobby Womack and Foreigner’s Lou Gramm and Mick Jones. Songwriters Hall gave The Associated Press a list of nominees in advance of the official announcement, set for Oct. 16. The gala takes place June 13 at the New York Marriott Marquis. Not sure what song(s) was nominated. We'll have to wait until the October 16th announcement. Eligible voting members will have until December 17th, 2012 to turn in ballots with their choices of three nominees from a non-performer and two from a performer category. Lindsey Buckingham, Christine McVie and Steve Nicks were together in Fleetwood Mac from 1975 to 1987, when the band enjoyed its greatest commercial success and released Rumours (1977)--one of the all-time biggest-selling albums. The classic hits “Rhiannon,” “Say You Love Me,” “Go Your Own Way, “Dreams,” “Don’t Stop,” “Tusk,” “Hold Me” and “Gypsy” all came from this period. 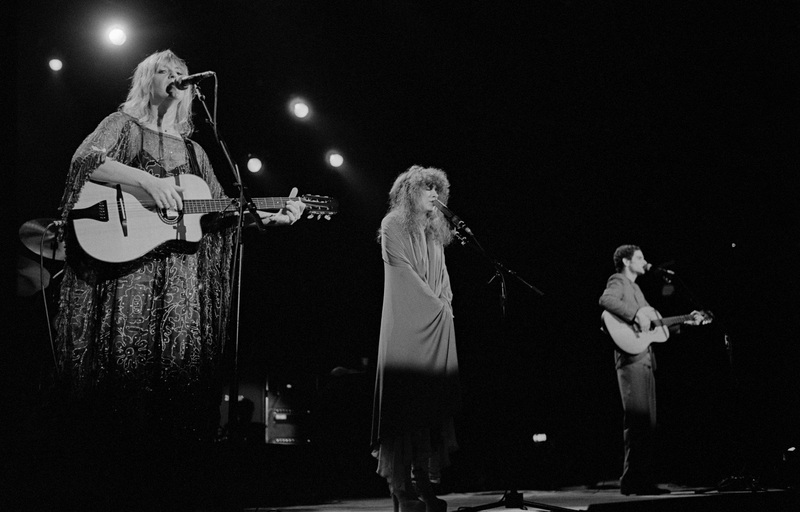 All three writers went on to solo success, as well as induction into the Rock and Roll Hall of Fame—with Fleetwood Mac—in 1998. Each of them deserve it!! Perhaps if they win Christine will come to NY to accept! Does anyone know how this process works? I can understand artists competing each other for current year-to-year awards, but how can veteran artists in this realm "lose" to other veteran artists of equal stature? If they aren't honored I'll be very angry. This award seems tacky. I think it's likely that Stevie and Christine's nominations will be actualized, Lindsey is doubtful. "Go Your Own Way'' was a killer with the quirky, bitter lyrics, and "Oh Diein' was good, but his true talent and genius is as a great guitarist and studio wizard. Stevie and Christine wrote better songs, more consistently. But I do hope Lindsey makes it in, too. Just doubtful. Imagine if one makes it in and another doesn't and one of them is still in the band. Could make for a ''fun'' tour. "I can still hear you saying you would never break the chain... A-HAAAAAA!" HAHAHA! To the Anonymous #3 describing Lindsey's Mirage contribution.... I remember a friend hearing this for the first time, asking "What is he saying? OH-OH, DYIN'?" Stevie will probably definitely make it in. Less people know the names Christine McVie and Lindsey Buckingham. Stevie had a huge solo career on the side of Fleetwood Mac, although it was a bit shaky at times. Nonetheless, they all deserve the award. Christine, especially for "Songbird." Christine plays guitar? Woah, cool! Aw, I miss Christine. She was the Melody maker award-winner way back in 1969. I'll have the biggest smile if she wins. I feel like Christine, who came from the most "non-mainstream" background, wrote the most "mainstream" songs. Sure, 95% of fans only paid attention to Stevie because of her immense beauty and sultry voice, but Christine was the real "pop" sound of the band. Stevie just really overshadowed everyone else. The Kennedy Center sends ballots around to industry peers who discretely vote on their colleagues in private. The votes are tabulated, the ones with the most votes fill the slots and the honorees are announced with no horse-race element to it. That's how it should be. I've never even heard of this "Songwriters Hall of Fame." I think this process is tacky and so the honor means little. So sick of these stupid groupthink awards that rarely get anything right in hindsight. And you know Lindsey's going to be PISSED is he loses. In this photo they are performing Lindsey's song "Save Me A Place" from the Tusk album. It is the only song Christine played guitar on during the Tusk tour. And all three of them deserve to win, they are all great songwriters. I don't think Lindsey will be "PISSED" if he loses. Contrary to popular belief, Lindsey doesn't get pissed at everything. He's gotten so many more important awards in the last couple years I'm sure this particular award matters little to him, and I doubt he's holding his breath awaiting the results LOL. He doesn't even think he's much of a songwriter, at least lyrics wise, so why would he expect to get an award like this? Personally, I think he's an incredible lyricist, and I'm not alone. But we don't even know what it's based on. Lyrics? Music? Popularity? Visibility? All three Macsters are good songwriters, though all very different. I agree with the commenter that said Christine is actually more the voice of FM, and her music is very representative as well, even though Stevie is more closely associated because she's the pretty one out in front. Which isn't to say Stevie doesn't write some good stuff too. Of course she does. Lindsey writes the deepest and most varied lyrics...in MY opinion(YMMV), and his technical and musical contributions are of course what he's best known for. But who's the better writer is totally subjective. Yes, he will be PISSED. I guess you didn't watch what Stevie said about THE DANCE and Lindsey's anger over losing the Grammy - and how that contributed - probably in a minor way - to Christine leaving. Lindsey is an extremely competitive person, which is part of what makes him such a great artist. Why do I feel as if I'm always fighting with long-winded celebrity hairdressers on this site? He may be a little disappointed, but I don't know about pissed. Stevie said they all expected a Grammy that year. She then singled out as examples Lindsey and Christine not being happy about the situation / not winning. Really? That's not what Stevie would probably say. I was trying to figure out last year, why was Stevie presenting an award to Bette Midler? Love Bette but, she didn't write too many of her songs! Yet, here she was being presented with an award by Stevie who so deservedly belonged in the Song Writers Hall of Fame! Let's just hope that the powers that be at the Rock & Roll Hall of Fame are paying attention! I'm curious, of those nominated, how many get in? Is there a fixed number of slots, only one? Confused. They finally get some respect on that side of the music business. Long time coming I personally think they all will get there as fleetwood mac members but if the rock in roll hall a fame is watching y is stevie not in the rock in roll hall a fame as a solo artist. come on its been thirty yrs. Anonymous at 3:27 really nailed the FM mystique and the likely reason their winning awards is a long shot.